Published By the Palestinian News & Info Agency (WAFA): President Abbas at UN calls on US to rescind decisions on Jerusalem, refugees. 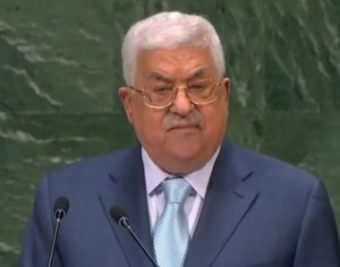 NEW YORK, September 27, 2018 (WAFA) – President Mahmoud Abbas called on the United States administration to rescind its decision on Jerusalem and refugees in order to salvage the prospects for peace. “Despite all of this, and from this august platform, I renew my call to (US) President Trump to rescind his decisions and decrees regarding Jerusalem, refugees and settlements, which contravene international law and UN resolutions, as well as the understandings among us, in order to salvage the prospects for peace and to achieve stability and security for the future generations in our region,” said Abbas. This law discriminates against the Palestinian-Arab citizens in Israel, granting the right to self determination exclusively to Jews in Israel and legislating discrimination against those Arab citizens, who constitute 20% of the population of Israel, in addition to other non-Jews who have immigrated to Israel. This law strips them of their rights as citizens.